Ahhh another day full of American cheer. Man, if there's one thing i've noticed since being here, it's just how good the yanks are at celebrating themselves. It's nauseating. So first stop today, Arlington Cemetary. The who's who of dead people. We decided to walk to the memorial for those killed on Pam Am flight 103 over Scotland in 1988 and embarked on a road which went around in a little circle (noticing a fairly sizable army funeral beginning nearby). By the time we'd come up around the other side, the army funeral was gathering and we were kind of unsure as to how to get around it... until a serious looking army dude started waving frantically (and kind of scarily) at us to actually walk across the grass. 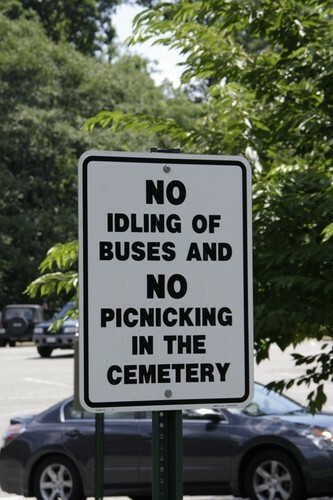 In other words, walk across multiple graves. Darren looked at him with this confused look and pointed at the gravesite like "are you for real?!" while I in the meantime was more than happy to follow instructions, and probably would have jumped off a bridge had he instructed me to do so. Typical bloody aussies in the wrong place at the wrong time! We had to stop on the side of the road for about 15 army/police/funeral cars to pass by. Needless to say, we gave up on that memorial. Darren did drag me on this massive walk to the memorial of the American Airlines flight which crashed into the Pentagon... seriously this was on the other side of the cemetary and it took AGES to get to and was thouraghly disappointing. Although i'm not entirely sure what would have made it interesting to be honest. On the way back from that was my biggest moment for the day - walking past a navy bus which had it's storage section open (you know, the bit on the side of the bus), no one around and just laying there in the storage compartment... multiple rifles. NICE!!! I mean, seriously! I could have literally walked up and taken one. Scared the bejesus out of me seeing all those rifles just laying there. Ok so I must admit I was incredibly unimpressed by the ability of the Americans to be self-important, to be self-indulgent and self-congratulatory. NOT wanting to by any means disrespectful to those buried there... But I did feel a sense of annoyance towards their blind patriotism. There were Americans everywhere ooohing and ahhing over graves... Only the Americans could turn a cemetary into a tourist attraction; I actually felt embarrassed to be walking around with a camera while soldiers were being buried (3 seperate servicemen being buried during the time we were there). It's no wonder only 11% of their population have passports - the way they obsess over American history, i'm surprised they have ANY knowledge of the rest of the world! And I'm sure the only reason they have knowledge of American history is because they make lots of movies about their 'moments in time'. More walking, more pain, back into the city and we were happy just to crash at a pub and watch the Spain v Portugal game. Cannot tell you just how sore our feet were by this point. After the game, a little more wandering around the city then back to the hotel around 6:30 pm. Phewwwwwwww I am tired! So tomorrow onto New York (kind of pleased about this, DC is starting to make me crazy with conspiricy theories) and Darren keeps telling me i'm talking too much so he'll probablby be glad to get rid of me. Seriously me, talk too much?